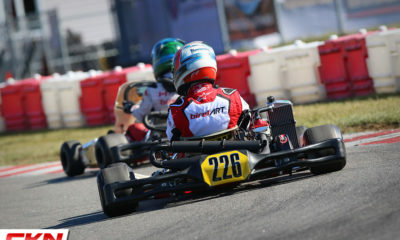 Long Read: Mackenzie Clark Chasing the Same Dreams As His Father – CKN | CanadianKartingNews.com | Because Karting is a way of Life! Stuart and Shelly Clark with their sons Brody (left) and Mackenzie (right). Every mention of karting makes this kid smile. He literally cannot get enough. Sitting in a booth at a local restaurant I can’t help but notice that these two are much more alike than I initially thought. Chatting back and forth about the upcoming season, both have this beaming look of excitement in their eyes as we catch up before I begin peppering them with questions for our interview. Stuart Clark and his son Mackenzie dreaded not having the chance to race the first round of the Florida Winter Tour, something that has become the norm of the Clark family over the past decade, but the anticipation for their 2017 season makes up for it with a full season of racing on the agenda. “There was definitely a deep withdrawal in the very early of January. I was messaging Trevor [Wickens] all the time. It was my second Winter not being down there and it was tough. Business has been very busy as well and financially it will be an expensive year, so it was needed to stay home and prepare for this upcoming season,” exclaimed Stuart. For 2017, things have changed and the racing focus has shifted officially from father to son, with this year all about Mackenzie while Stuart continues his retirement from racing and Mac going full-throttle on the National level in Canada in Rotax Junior. As a part of the Prime Powerteam, Mackenzie is one of many team drivers who have switched from the Maranello Kart to the BirelART chassis for the 2017 season. 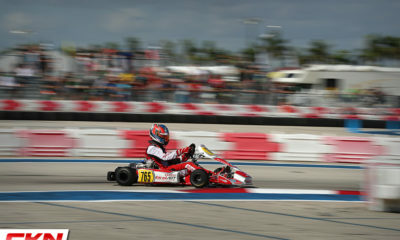 He got his first taste of the chassis and the much faster Rotax Junior class at round two of the Florida Winter Tour in West Palm Beach, and is now ready to challenge Canada’s best Rotax racers, with hopes of earning a spot on Team Canada for the Rotax Max Challenge Grand Finals. But before I build anymore up to this season, lets look back at how it all began. It all started with an opportunity for Stuart Clark. 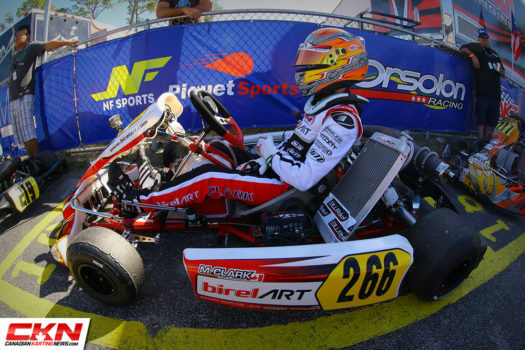 Back in 2003, Clark found himself beginning his karting career in the big leagues as part of the Cameron Motorsports National race team. 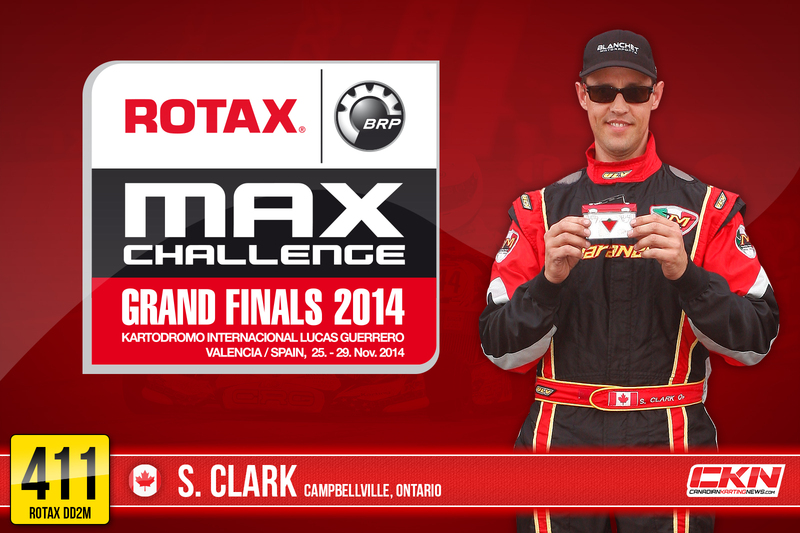 Taking part in the Sunoco Ron Fellows Karting Championship as a rookie, Clark raced against Ontario’s best in Rotax Senior and for the most part, he held his own, unlike many others who jumped in the deep end as part of Cameron’s program. After that season, it was time to settle down and Stuart and his wife Shelly had their first child, Mackenzie. It meant Stuart’s karting career was put on hiatus as the family began to grow. Fast forward to 2008, now with two kids, and Stuart was back in action, racing again with Cameron Motorsports but now under the watchful eye of Trevor Wickens and competing in Rotax DD2. 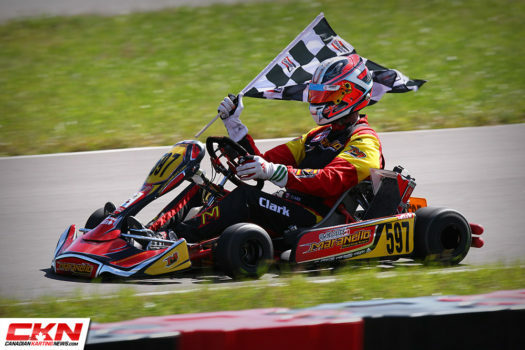 It was a rocky return as Clark came back to grips with the sport and the two-speed DD2 category, now racing in the Brian Stewart Racing Karting Championship as well as club racing at Hamilton Regional Kart Club. But he never gave up and pushed forward, continuing to improve and racing nationally against Canada’s best. His perseverance would pay off as Clark continued to push his limits and is now a 3-time ASN Canadian National Karting Champion, all in the Rotax DD2 Masters category. 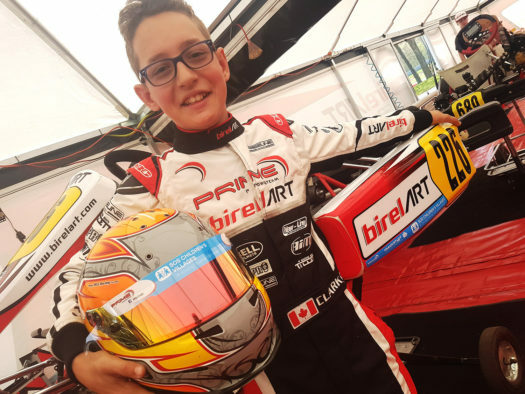 In total, he earned the chance to represent Team Canada at the Rotax Max Challenge Grand Finals five times including Portugal twice, UAE, USA and Spain. While Mac doesn’t have much recollection of his fathers first two National Championships, other than celebrating them after the races, racing alongside him at Canada’s premier event in in 2015 at Mosport Kartways is a very fond memory that he will cherish for many years to come. A very special moment that built up a very strong urge to get in his own go-kart. Being great friends with the Clark family over the years allowed to me see just how interested Mackenzie was in racing, especially from a young age. He would try to help his dad with the kart at tracks around the world and more often then not he could be found just cleaning the kart. Mac was hands on and kept up with stats and information and was always reading about the sport and races big and small. Patiently waiting, Mac was eager to drive anything, including fun karts at amusement parks. In 2014 it was finally time for Mac to get a taste of racing as Stuart signed him up to race at the Waterloo Regional Kart Club in the Novice 4-cycle category. All throughout the Winter father and son spent time in their home garage to build and prepare their kart for the season. Mac was fitted into a retro Maranello suit that was found in the race garage at Hamilton, to be like dad, and by April they were ready to go. It was a rocky year but the improvement continued throughout and at the final race of the year Mac was crowned as the WRKC Novice Rookie of the Year, taking home a big trophy at the banquet, that features the name of this writer from way back in 1999. A year of racing was complete and Mac was more interested than ever! 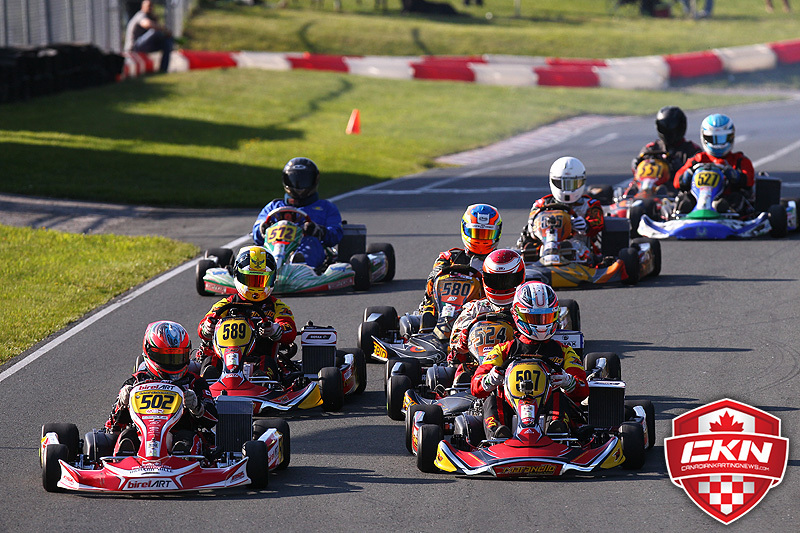 The following year, Mac stepped up to Junior Lite at the club and also took part in his first Canadian Karting Championships as a driver at Mosport Kartways, racing alongside his dad. It was an eye opener and an opportunity to race with Canada’s best and absorb it all in. 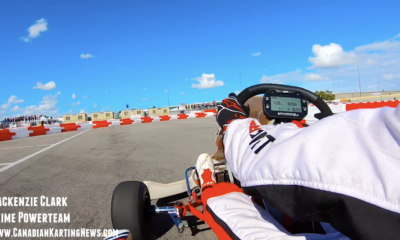 He was quick to note that it was a much different race as a driver than it was a spectator and it fueled his passion to continue his progression up the karting ladder. “In Briggs I learned more race craft for better and more passes. More control at higher speeds and racing in the large fields helped boost my experience, especially at the Nationals. 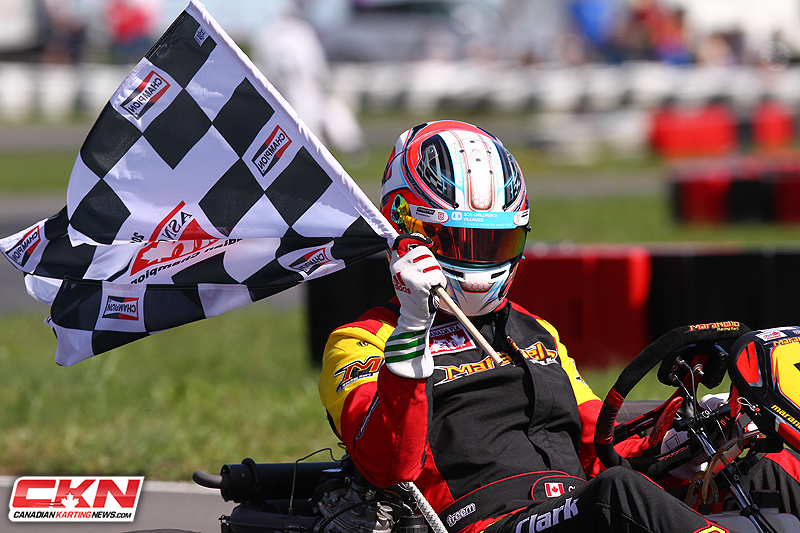 Racing at Flamboro (WRKC) was very competitive and it really helped me grow as a driver,” explains Mac. When the season came to a close, Mac and Stu decided it was time to step up to the big leagues and purchased a Rotax Max powerplant along with a new kart for Mac to race in the Rotax Mini-Max category. This also meant the end of Stuart’s racing opportunities after entering a few Canadian Touring Car Championship (CTCC) races with Blanchet Motorsports. A long Winter passed as the pair were unable to make it down to Florida to take part in the Florida Winter Tour for Mac’s debut in Mini-Max. Instead they spent days at Goodwood Kartways in the early spring to come to grips with his new beast while also gaining more confidence in his Briggs & Stratton Junior kart. It was going to be a very busy season. Competing in two categories kept the two on their toes. Mac was hands on to help in any way he could in preparing the karts and making changes on race days while Stuart really learned what it was like to be a kart mechanic. 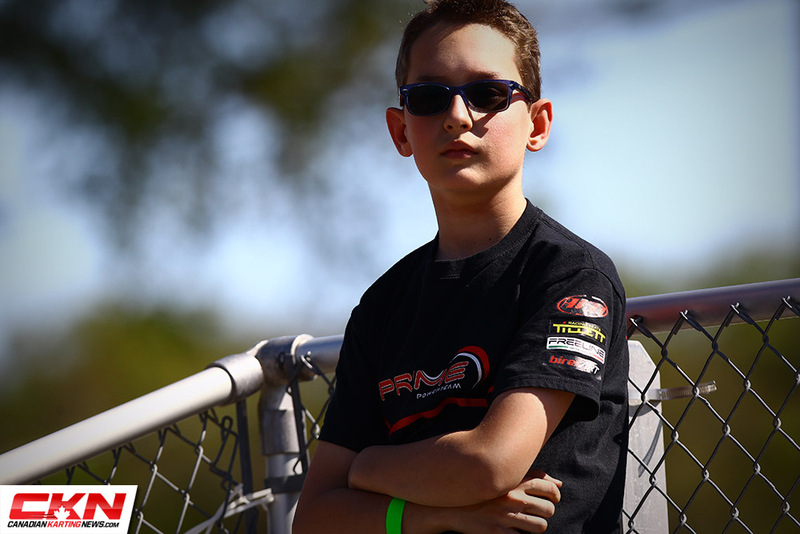 Now in 2017, Mackenzie’s progression continues as he has advanced up to the Rotax Junior class. He got a couple races under his belt at the Florida Winter Tour and is now ready to take on Canada’s best in quite possibly the most competitive category. Part of the agreement in order to allow Mac to race is his success at school. He knows that if his marks begin to fall his chances to drive will be stopped and thus education is always on his mind. And it’s not only his current position in school that is on his mind, but also his future. Even at the young age of thirteen, Mac has an idea of where he wants to study after high school. Being a professional driver is obviously first on his mind but both Clark’s know that the opportunity is one in a billion and requires some significant financial support. But that doesn’t stop Mac from realizing that he still has a potential future in Formula 1. He’s already been looking into studying in the United Kingdom after high school where he could be closer to the European motorsports world and possible formula car outfits. Going to the UK would also move Clark back to the families homeland with roots deep in the region, opening up other opportunities as well. Mac is also following in his fathers footsteps in supporting the SOS Children’s Villages. When Stuart started racing cars, he also supported the charity. Now Mackenzie will do the same and giving himself a little more to race for. While he still has a few years to come and many races to compete in, that future isn’t quite here just yet. But with this forward thinking and pushing to pursue his dreams, anything is possible for Mac as he chases the same motorsports dreams that his father once chased. A dynamic duo on and off the track, Mackenzie and Stuart Clark are just one of many special father-son pairs that tear up kart tracks week after week across our great country. To learn more about the SOS Children’s Village, visit https://www.soschildrensvillages.ca/. To follow along with Mackenzie Clark, check out his Instagram page.